CPA Central: Judges Decision Reversed! CPAC Headquarters – Just days after the historic victory by RPF over the defending Champions the Dark Warriors, new evidence has been revealed exposing RPF multi-logging at the CC final. Blue, how would you describe DW and CPAC’s current relationship? As if that wasn’t enough, immediately after their Victory, RPF leader Elmikey had this announcement to make. Such a shame that both armies were so into the verdict that they forgot the part where Blue1 said “Unless there is evidence of RPF cheating” they would be the winners. All but one person had forgotten Blue’s words. That person is now considered a god in the Dark Warriors and has been promoted to owner along with the 12 others they already have……. That person is none other than Earthing (Former Extrate Army Leader). 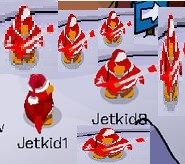 As you can tell by the image above, the penguin on the far right is standing beyond the blue arrow and all of us as professional club penguin players know that once you go past that line you are suppose to be transferred to the next room, not stay in the one you are currently in, so after a thorough analysis of the photo, it was determined that RPF did in fact cheat at the finals by multi-logging. With that being said, I would like to award the CPAC Christmas Chaos III trophy to the newly announced winners and champions for two years in a row, the Dark Warriors!!! After Earthing discovered this new evidenced and helped overturn CPAC’s decision, is there anything that you would like to say to him?